Rugged Visual Wind Vane (non-electronic) with low friction bearing provides a convenient way to see which way the wind is coming from. 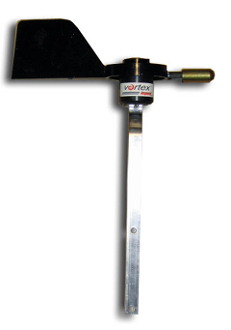 Available with Vertical Bracket for mounting wherever you wish, or an Offset Bracket for mounting with the same screws as the Vortex Wind Sensor (see note), or and offset bracket for use with the Mag Mount mounting (see photo). Note: Early Vortex Wind Sensor brackets were hand-drilled, so the holes may not line up, potentially requiring some drilling. Wind sensors acquired from 2004 and beyond should have matching holes. The bracket is 1/8" aluminum - very easy to bend or drill. NOTE: the mag mount mounting option is for the Inspeed Mag Mount anemometer and does not include a magnetic mount. It is as shown in the photo.